They might not be authentic, but these quick-fix versions of the Mexican Quesadilla work really well as a work night dinner. 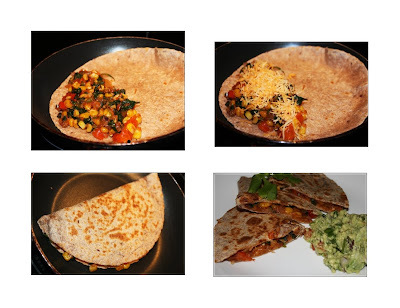 And there are so many ways to fix these up - here I used a stir-fry of onions, corn, tomatoes, bell peppers and spinach with taco seasoning and lime juice, but our favorite version has to be the onion, red bell pepper, green bell pepper and paneer filling. I add my taco seasoning mix to most of the stir fries but you can also add cumin powder and red chilli powder for a different flavor. And I use store-bought tortillas. Make sure to brush the sides of the tortillas with a little oil so they get nice and crunchy. Serve with salsa/ guacamole/ sour cream (or dahi butter)/ refried beans and Mexican rice for a complete Mexican meal in the comfort of home. This entry was posted on 7:04 AM and is filed under Food and diet , My life , Quick recipes . You can follow any responses to this entry through the RSS 2.0 feed. You can leave a response, or trackback from your own site. can be made with leftover rotis too. I love snacking on them, they are kind of crisper, and taste yum with a smear of achar masala/ filling of onion tomato masala. We make many of these as well, use chicken many times. I'm a huge fan of burritos. I've only tried wrapping with similar fillings (with store bought tortillas), but alas, the taste was not even nearly like the ones in those tiny shops in the tube stations. I think I hv liked quesadillas in Chilis restaurant. This one looks so yummm....specially with the side of Guac! Bubbles - When I'm not following a recipe I never get hung up on authenticity. I just make what I enjoy and try to prepare healthy, satisfying and most importantly quick meals. This one works on all counts which is why I love it. We are watching our weight so the cheese is just a sprinkling, but you can always make it a melty, cheesy, gooey quesadilla in which case it will be doubly tasty! Angel - TBH I dont 'like' the whole wheat much either, except when I make rotis, but I force myself to eat them for the nutritional value. If you want to try getting into them and have a Trader Joe's around, their whole wheat tortillas are the best tasting cooked ones I've found. For uncooked, Costco used to have some which were amazing, I even used them as rotis (cannot remember if they were whole wheat or just wheat, I'm thinking the latter just based on taste). Unfortunately, we're not members anymore. That saying is crazy!! Maybe if I remember that I wont feel that bad abt eating whole wheat !!! You made these?? Looks yummy!!! I don't think I have tried them ever!! 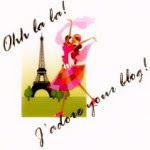 S - Thank you ... and welcome to the blog!